Bit Stew Systems (Now Part of GE) offered the premier platform for handling complex data integration, data analysis and predictive automation for connected devices for the Industrial Internet of Things (IIoT). Purpose-built for the IIoT, Bit Stew’s data integration platform solved the data integration challenge at scale for complex industrial data environments. Prior to acquisition by GE, Bit Stew earned global recognition by being named to Gartner’s Cool Vendors List and as Frost & Sullivan’s Entrepreneurial Company of the Year – North American Service Solutions. In 2015, Bit Stew was ranked as one of the Top 100 Analytics Companies and Top 100 IoT Startups by Forbes. Bit Stew Systems (Now Part of GE) offered the premier platform for handling complex data integration, data analysis, and predictive automation for connected devices for the Industrial Internet of Things (IIoT). Purpose-built for the IIoT, Bit Stew’s data integration platform solved the data integration challenge at scale for complex industrial data environments. 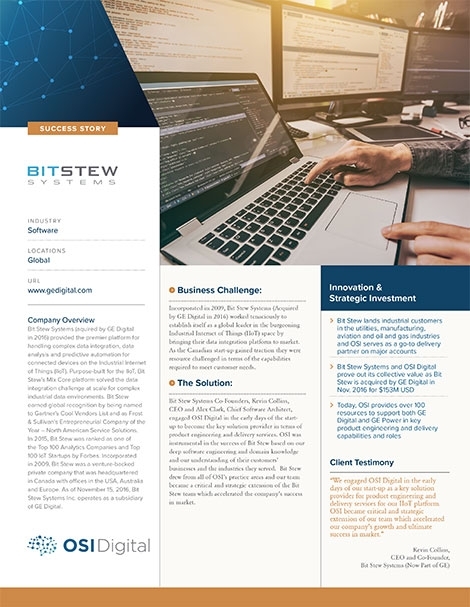 Prior to acquisition by GE, Bit Stew earned global recognition by being named to Gartner’s Cool Vendors List and as Frost & Sullivan’s Entrepreneurial Company of the Year – North American Service Solutions. In 2015, Bit Stew was ranked as one of the Top 100 Analytics Companies and Top 100 IoT Startups by Forbes. Incorporated in 2009, Bit Stew Systems worked tenaciously to establish itself as a global leader in the burgeoning Industrial Internet of Things (IIoT) space by bringing their data integration platform to market. As the Canadian start-up gained global traction, they were resource challenged in terms of the capabilities required to meet market growth and new customer needs. Bit Stew Systems Co-Founders Kevin Collins, CEO, and Alex Clark, Chief Software Architect, engaged OSI Digital in the early days of the start-up to become the key solution provider for product engineering and delivery services. OSI was instrumental in the success of Bit Stew based on our deep software engineering and domain knowledge and our understanding of their customers’ businesses and the industries they specialized in. Bit Stew drew from all of OSI’s key practice areas and our team became a critical and strategic extension of the Bit Stew bench which rapidly accelerated the company’s meteoric rise in the global industrial IoT market. Bit Stew lands industrial customers in the utilities, manufacturing, aviation and oil and gas industries and OSI serves as go-to delivery partner on major accounts.